One of the most strategically situated NATO member nations has American-made F-16 fighter-bomber jets streaking low over Istanbul and Ankara. 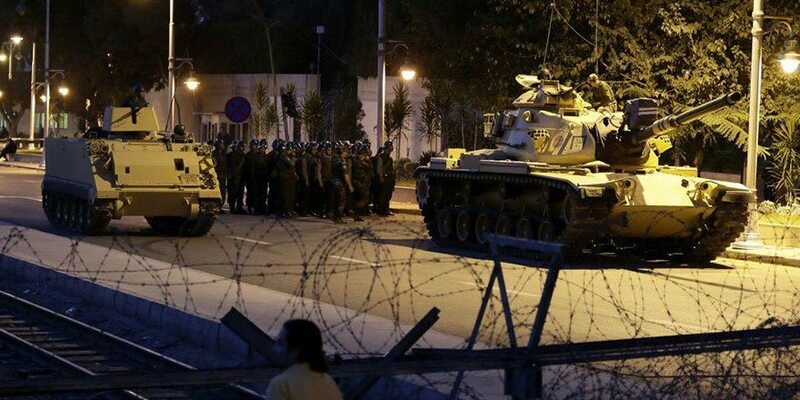 Not ending there, troops, tanks and armored personnel carriers are also patrolling the streets throughout the nation’s capital city of Ankara. According to Fox News, the Turkish military is claiming an armed takeover of the government of Turkey is a complete success. FNC is also citing that “state television” is verifying the military’s claim, announcing that a Turkish Army “Peace Council” is in control of the country. FNC also reported first-hand news from freelance reporter Laura Wells who is based out of Istanbul. According to Wells, President Tayyip Erdogan is currently vacationing in a friend’s villa located in the coastal town of Marmaris in the southwest of the nation. The freelancer went on to say that she’s uncovered that the Turkish Navy has surrounded the villa and is stopping anyone from coming or going from the compound. No further information on the status of Erdogan has made its way to the Western press as of yet. The armed forces had taken power in the country to protect the democratic order and to maintain human rights, the military said in a statement sent by email and reported on Turkish TV channels. All of Turkey’s existing foreign relations would be maintained and the rule of law would remain the priority, it said. The state-run Anadolu news agency said the chief of Turkey’s military staff was among people taken “hostage” in the capital Ankara. Seen as one of Barack Obama’s closest allies on the world stage, Erdogan has been criticized over the past few years for moving the secular nation towards a more Iranian-like Islamic Republic ruled by Shari’a Law. Erdogan has recently threatened to end the “existence” of the highest court in the nation, the Constitutional Court, after they have made rulings not to his liking. The president has also seized control of a leading opposition newspaper and also replaced the Editor-in-Chief. Many of Turkey’s more militant imams have given a full throated approval of the president’s clamp-downs on the free press and secular courts. As a long standing member of the NATO alliance, the Turkish Armed Forces have extensively trained with other member nations, especially the United States and Great Britain. Military and political watchers have long considered the Turkish military as overwhelmingly pro-Western. After a night of explosions, gunfire and tanks rolling along the streets, President Recep Tayyip Erdogan told Turkey Saturday that an attempted military coup was over and the government was in charge. However, the sounds of fighting were still being reported in Ankara and Istanbul after the chaotic attempt by members of the military to wrest control from Erdogan. At least 60 people died and 1,000 people were injured across the country.